"In over 30 years of collecting and selling antiques, I have seen the gambit of products from sperm whale oil to synthetics and I have not found anything better than Old West snake Oil. With its all natural formula, I haven't found any other product I like better." Frontier Gallery is moving to Fort Collins! As of early November, the new address will be: 208 S. Mason Street, Ft. Collins, CO 80524. The phone number remains the same. We will post an update when we have the exact opening date and times of operation. Please come up and check out the new store! Frontier Gallery is featured on CNTV. For very interesting information on antique firearms and antique weaponry, view our video on YouTube. This product is a special blend developed specifically for the wood of older Winchester firearms (pre-1964). What's new about this formula is that it has a small amount of the old Winchester stain in the same great Old West Snake Oil you've grown to love. The new Formula #2 will add just a touch of the original Winchester type color back to the wood. This stain not only helps reduce the visibility of scratches and mars in the wood, it adds just a touch of color to help cover those scratches and mars and brings out the original color of the wood. The new Formula #2 was introduced at the famous Colorado Gun Collectors Show in May and was a complete sell out! Not a single bottle left after only two days and we have are orders for more. The response was overwhelming and everybody loved what it did for the wood on their Winchesters and other guns too. 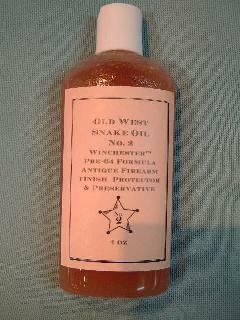 Old West Snake Oil will protect and preserve antiques of all types. You'll love the way it works on wood and metal. All for only $19.95 a bottle! Credit card processing is available with phone orders. Call us at 303-475-8044 to place your phone order. Old West Snake Oil is perfect for protecting Revolutionary War Guns, Civil War Weapons, WWI & WWII Militaria, and Indian War collections. Our Metal and Wood Oil is superb for antique furniture care on items like Hoosier cabinets, tables, side boards, dry sinks, and buffets. 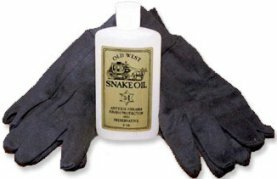 Snake Oil is ideal for antique firearms such as Winchester Rifles, Colt Revolvers, Smith & Wesson Pistols, Browning Shotguns, Harpers Ferry Muskets, Springfield Trap Doors, Hawken Rifles, Kentucky and Pennsylvania Full Stocks and Plains Rifles. Great for protecting your Cowboy Action Shooting firearms at SASS and other events. Our customers are always finding new uses for Old West Snake Oil. Read more about how you can increase the value of your antiques on the " What Customers Say " page. © Ironhorse Industries. All Rights Reserved.